If you’re not a fan of the traditional 12pm start that most Dubai brunches demand, and prefer to sleep in on weekends, then these evening brunches are the perfect compromise. If you love pizza and you love prosecco, head to Via Veneto’s newly launched Thursday and Friday evening brunch from 7pm – 10pm. Enjoy a relaxed Italian atmosphere with an unlimited supply of pizza and prosecco. Three options to choose from include the ‘fiery pizza’, a spicy option with tomato sauce and a selection of mixed chillies. Next there’s the ‘cacio e pepe pizza’, a pizza topped with a base layer of ice cubes to make the base wet and soggy to stick the Pecorino cheese on the top. Ending on a sweet note, enjoy the ‘flaming tiramisu pizza’ with Mascarpone cheese, Nutella chocolate, and espresso coffee powder. The details: Every Thursday and Friday evening from 7pm to 10pm. Priced at AED149 for ladies and AED199 for men. Enjoy the best of Latin American cuisine at WAKA Restaurant & Bar’s Late Brunch that takes place every Friday from 8pm – 11.30pm with packages inclusive of fantastic food, beverage and entertainment. 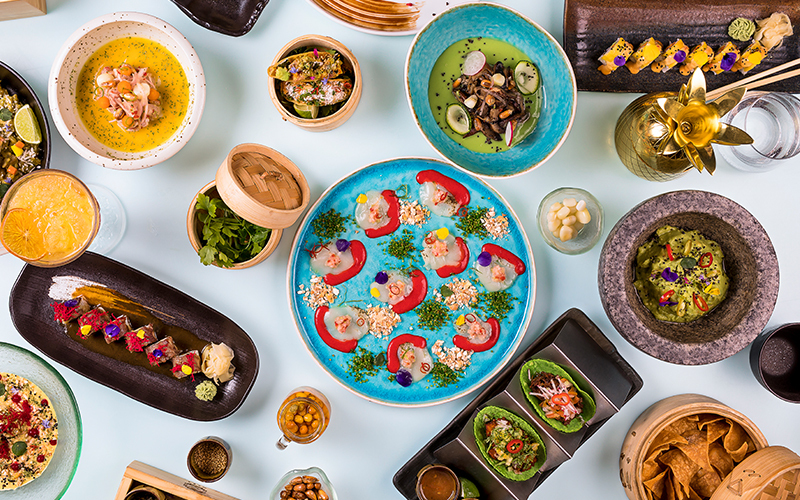 Waka is the latest addition to the growing number restaurants in Dubai serving Nikkei (Japanese-Peruvian fusion food). At Waka’s new Friday Late Brunch, there’s an a la carte menu, alongside buffet options for main course. All dishes on the a la carte menu can be ordered an unlimited amount, there’s wakamole (the restaurant’s take on traditional guacamole), sizzling chicken anticucho served straight to the table and plenty of different types of maki. For main course there’s a tasty ‘cazuela de lubina’ (sea bass, Peruvian dry potato, aji, cheese and black mint) that’s well worth a try. The buffet bar keeps it simple, with four options: del Mercado ceviche, sansei tuna ceviche, corn salad and a mixed salad. The details: Every Friday from 8pm – 11.30pm. Priced at AED285 with food and soft drinks, AED375 for food and house beverages, AED550 for food and premium beverages, Dhs200 for house beverages only and AED400 for premium beverages only. Contact: Call 04-4441455 or e-mail reservations@waka.ae. If you enjoyed this story, you might be interested in these Abu Dhabi brunches that are not to be missed!